So without further ado, here is this Monday's muffin tin lunch... the theme this week was "colors of the rainbow". I'm sad to say I was feeling very uninspired today with it. 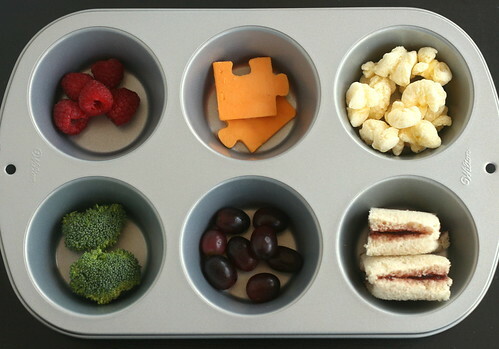 raspberries, puzzle shaped cheddar cheese pieces (April is Autism Awareness Month, all month long! ), Trader Joe's "pirate booty". The cheese was cut with the Lunch Punch puzzle set. Bottom row: broccoli, purple grapes, grape jelly sandwich. Pirate Booty is so yummy! Great tin! love it. and your colors are great! I love the puzzle pieces= Very cute! Still haven't had Pirate's Booty. Maybe this weekend when I'm near a Whole Foods.